As a review, last year I posted this: "Edward William Johnston was born on October 17, 1799, at Longwood, Prince Edward County, Virginia. He died on December 9, 1867, in St. Louis, Missouri. In between, he married Marie Antionette Estelle Costar Villagrand on February 7, 1824, probably in New York City, and she died in Washington, D.C., on December 15, 1848. 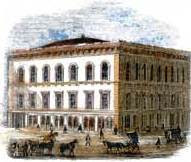 Edward moved to St. Louis, Missouri, in 1855. [Note: He married Margaret A. Johnston sometime in the 1850s or thereabouts]. So far, so good. Edward W. Johnston died St. Louis, December 9, 1867. Professor of history and belles lettres in University of South Carolina, Editor or associate editor of Richmond Whig, National Intelligencer, New York Times, St Louis Intelligencer and Leader." Complete post via this Link. Now, thanks to the sleuthing and generosity of Mary R. Davy, there are additional details about Edward William Johnston that can be gleaned from memorial newspaper accounts published soon after his death. Edward William Johnston, a literary man of considerable celebrity, died at 7 ½ o’clock yesterday morning, at his residence, on Dayton Street, after an illness of over four months. He was sixty-eight years of age on the 17th of last October. His wife [Margaret] is also in the last stages of consumption. General Joseph E. Johnston, a brother of the deceased, has been telegraphed, and will be here to-day. Mr. Johnston was for ten years the literary editor of the National Intelligencer, was in turn chief editor of the Richmond Whig, the New Orleans Crescent, the Cincinnati Inquirer, the St. Louis Leader, and several other political papers. He was at one time librarian of the Mercantile Library of this city, and compiled its first catalogue. He was a finished scholar, a graceful writer and an amiable and polished gentleman. It was understood some time ago that he was engaged in writing a history of the rebellion, but we did not hear how far the work had progressed at the time of his death. Early in his life he was Professor of Belle[s] Lettres in the University of North Carolina [actually at South Carolina College, now the University of South Carolina], and throughout his life literature was his profession. Death of Edward William Johnston. Edward William Johnston died yesterday at half-past seven o’clock, at his house on Dayton street, after a protracted and painful illness which he bore with manly fortitude and Christian patience. He died in full communion with the Roman Catholic Church. Widely known and respected in the Republic as one of the most brilliant scholars and writers in the United States, he is entitled to most honorable mention now that he is dead. Mr. Johnston was a native of the State [Commonwealth] of Virginia. His father was an officer in the Light Horse Cavalry, commanded by General Harry Lee, of Revolutionary celebrity. He was a brother of that able Confederate soldier, General Joseph E. Johnston, who will be here to attend the funeral of one between whom and himself there existed the tenderest relations of fraternal confidence and love. From his father, who was a man of remarkable culture and taste for letters, Mr. Johnston imbibed, at a very early age, those tastes for literary pursuits which occupied all his years. At a very early period of his manhood he was called to fill the chair of history and belles lettres in the University of South Carolina at Columbia. Ambitious for a wider field of influence, he became connected with the public press, and, during the greater portion of his long life, was counted among the most brilliant and effective writers on the staffs of various journals. He was first, we believe, associated with John Hampden Pleasants in the editorial management of the Richmond Whig. Afterwards for ten years he was associated with the NATIONAL INTELLIGENCER as literary editor of that journal. He was subsequently connected with the editorial staff of the New York Times, and is remembered for his brilliant correspondence with the Philadelphia North American and the Louisville Journal. 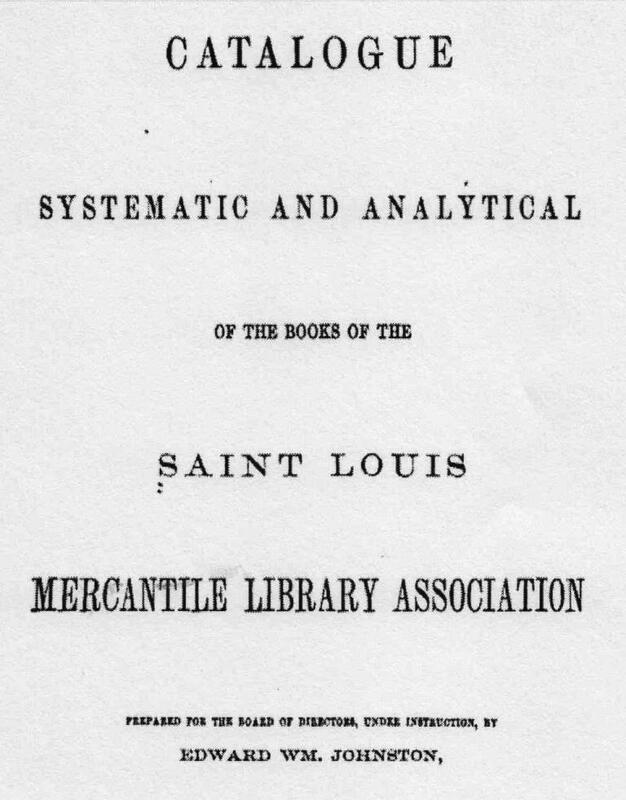 In 1855 he came to St. Louis and was associated with Mr. Mitchell in the editorial direction of the Intelligencer. When the Leader was established Mr. Johnston was invited to take the place of associate editor of that journal. He continued in that relation till the paper closed its career, when he was elected librarian of the Mercantile Library in 1858, we believe, occupying that post for three years. 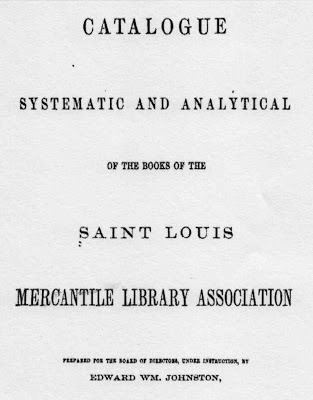 In that capacity his rare knowledge of books and his familiarity with the whole range of literature, his judgment and tastes made him a most valuable auxiliary in building up that magnificent library and establishing its character as one of solid and substantial value in the various departments of science, philosophy, history, and general literature. The present catalogue of the library was completed by him, the principle of its arrangement and classification being his own [“Baconian”]. We are scarcely able to say what line of literary pursuit or of study Mr. Johns[t]on had a preference. He had a marvelous versatility and universality of knowledge. He confined himself in no narrow line. There was scarcely a topic beyond the range of his information. Those who enjoyed companionship with him found that there was no subject that could be named upon which his conversation would not flow, rich with accurate and well-digested knowledge. His memory was surprisingly retentive and ready, and to many of his friends he was a reliable encyclopedia, quickly responsive to every inquiry. His taste was refined and discerning, and in most matters unerring, while his masculine, cultivated judgment made him a safe counselor in all matters of literature. His knowledge was not confined to what may be technically called literature. His acquaintance with public affairs, public men, and national politics was extraordinary. As a writer, he had few equals in brilliant and vigorous rhetoric, copiousness of learning, and robust, original thought. He was remarkably independent and firm in his opinions, courageous in their utterance, and tenacious in their defense. Indeed, his just moral courage of opinion and action are remembered as among his striking characteristics. His active intellect seemed to be sleepless, impelling him to industry that seemed never to weary, though his slight frame gave no token of physical strength. Personally, he was graceful and genial, with a spotless integrity and purity of character. As a companion, he was distinguished for his gentlemanly suavity and courtesy, and as a conversationalist, he was brilliant and absolutely inexhaustible. His memory will be cherished in most tender regard and with unaffected honor by many in St. Louis and elsewhere, whose intimate associations with him revealed his rare personal excellence and worth. His funeral will take place upon the arrival of his brother General Johnston, -- St. Louis Republican, December 10 . The December 17, 1867, Richmond Whig (Vol. 46, issue 100, page 4) ran the same (preceding) article -- originally from the St. Louis Republican -- with only minor typographical differences, but also with this significant addendum: Mrs. Margaret A. Johnston died in St. Louis on Monday [December 9, 1867], a few hours after the demise of her husband, William Edward Johnston, a brother of Gen. Joseph E. Johnston. Calvary Cemetery, Edward Wm Johnston, burial date December 11, 1867. Age: 68. Margaret Johnston, burial date December 11, 1867. Age: 46. Question: When were Mary A. Johnston and Edward William Johnston married, and where? (Presumably in the 1850s, possibly in St. Louis under Catholic auspices). Update (notes): Edward married Margaret Wooley (Woolley), daughter by a first wife of Abraham (Abram) R. Wooley (Woolley), a former lieutenant colonel whose second wife was a Preston, sister of the first wife of Albert Sidney Johnston. Or so it would seem.